For each recipe below, add the ingredients listed into your container first, and then fill the rest of the container with unflavored kombucha tea. Most of these start with kombucha tea made with black tea, unless otherwise noted. Flavorings were added to a 16 ounce bail top jar, or a pint or quart mason jar, as noted. Flavorings are added after the initial brew when the kombucha is bottled. You add the flavorings and fill jar with plain kombucha. Serve immediately, or store for a few days (sealed) to increase carbonation. 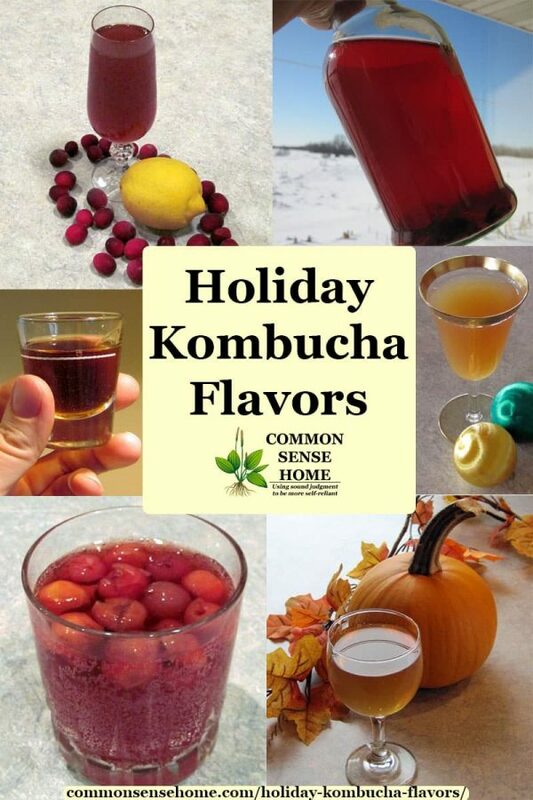 Recipes with spices are best consumed within a few days, otherwise you may diminish the health benefits of your kombucha. 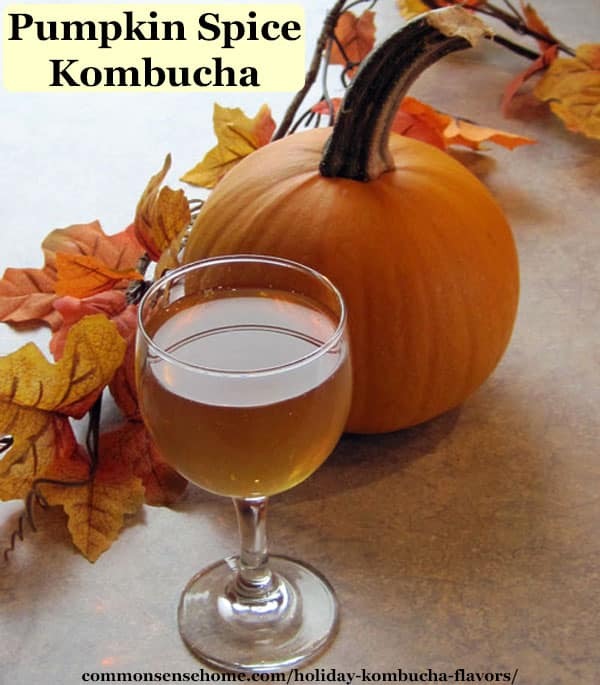 (Many spices are antibacterial, and kombucha is made up in part of bacteria). 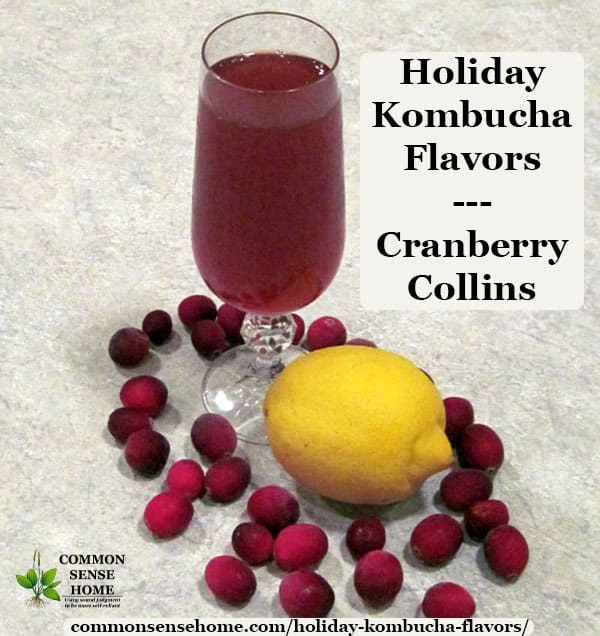 Cranberries are so abundant during the holidays that cranberry collins is a natural first choice for our holiday kombucha flavors. When ready to serve, strain or pour off the top of the jar to have a chunk free beverage, or stir to get all the pumpkin goodness. Fill jar with plain kombucha. Serve immediately, or store for a few days (sealed) at increase carbonation. *Note – chocolate extract may have questionable ingredients, so read the label. Alternately, you could use plain cocoa or chocolate drink mix, but those don't blend nearly as well. This flavor option also goes very well with almond blossom oolong tea from Frontier. Pomegranate juice and African redbush tea also pair well with cherries. 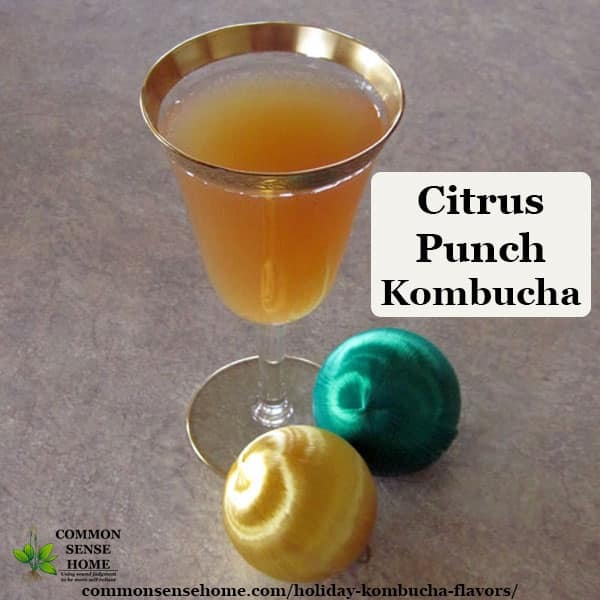 November and December are also a good time of year to get great deals on fresh citrus, so a citrus medley wraps up our holiday kombucha flavors list. Originally posted in 2011, last updated in 2018. Great post! 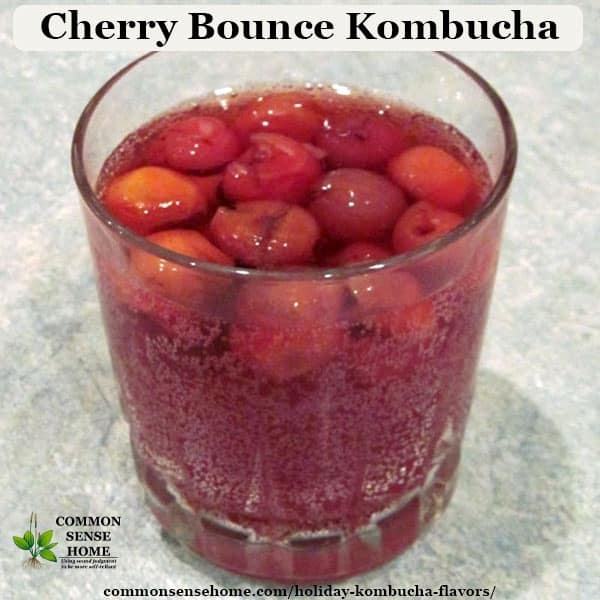 I am still wanting to make kombucha but when I get the hang of it I am going to come back to these recipes! I choose this post as one of my top 3. Hope you link up at H2W this week! Be on the look out for my blogs new makeover! Thanks, Rachel! I'll be sure to stop by. Hi Laurie, I am enjoying your site. You might enjoy the website culturedfoodlife.com by Donna Schwenk. 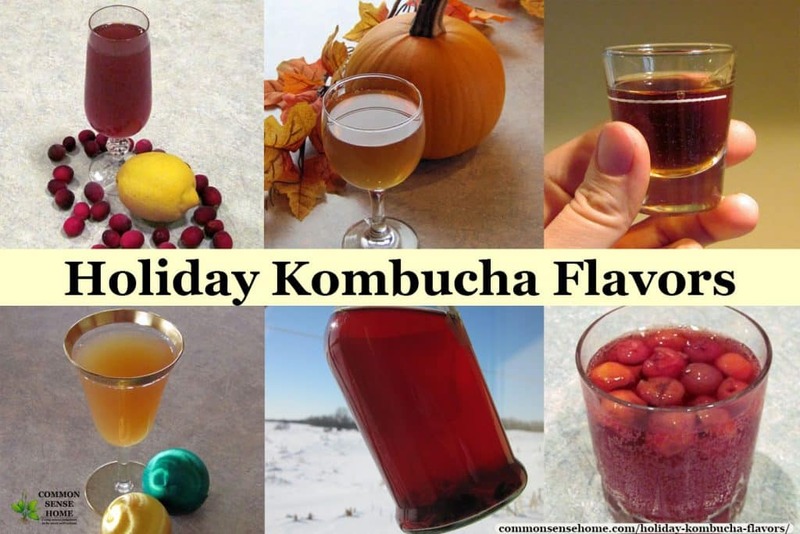 She has been making lacto-fermented and cultured foods, kefir and kombucha for years and has some really wonderful recipes and lots of information about the health benefits of cultured foods. She has a lot of info about the positive impacts these foods have had on her health and the health of her family! Thanks again for your interesting site; I’ve gotten a lot of info. Oh yes, I love Donna’s recipes and ideas! She’s got a lot of great material. I’ve got her new book on my wishlist. Are you familiar with Canfield’s Chocolate soda? It got me through an extremely long medically mandate bed rest that could have added pounds to my weight. And almost 30 years later, I had this urge to find out if anyone has used chocolate extract and kombucha to replicate the taste. .?? I have not heard of that one, but it doesn’t surprise me. I think a good quality chocolate extract (like Frontier) would give you some hint of that flavor, but the fermented flavors of the kombucha will always play a strong role in the overall flavor profile. Have you ever flavored the kombucha with liquid stevia and then bottled it? I bottled it and it tasted great when it was done but it had a sulfur type smell to it – quite unpleasant. Any idea what happened? Would it be possible to sweeten it with xylitol before bottling? Basically, I am trying to make a sugar free kombucha that is still sweetened with a natural sweetener that doesn’t spike the blood sugar at all (stevia/xylitol).. I have used the liquid stevia and bottled it, and didn’t end up with any off-putting odors. I *think* you could use xylitol, but am unsure if it might react with the bacteria in the kombucha. 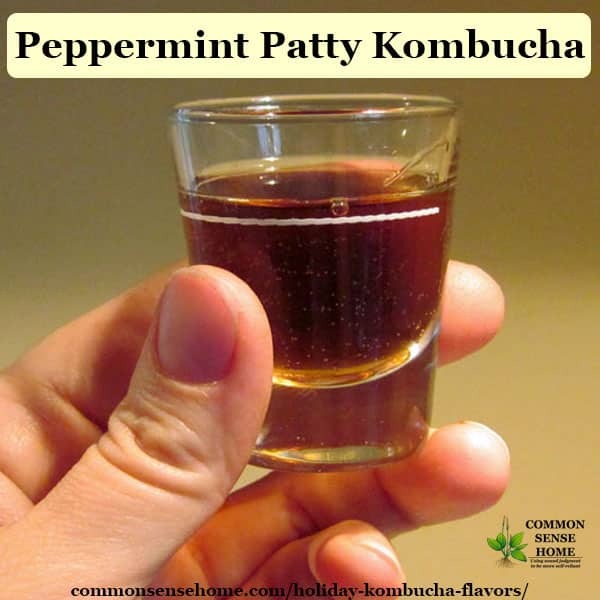 I use a few drops of liquid stevia after the 2nd phase, when I go to drink my kombucha. For sweetener, could you use monk fruit extract? I wonder if that would have smell issues or impact the kombucha. I haven’t tried monk fruit extract because it’s not readily available around here. I know you couldn’t use it during the brewing process, but it might work for flavoring. I’m new to kombucha and am starting to make my own soon. I have a TON of flavored teas (loose/bagged/black/green). Can I use them to make the kombucha? What experiences have you had? I’ve used green, oolong, black, and an assortment of other types. I do try to keep one culture going in black tea and experiment with the other, in case something does not work well. Don’t use Earl Grey, as the oils in the tea are bad for the scoby.